Ayurveda, which is the traditional medicine of the Indian subcontinent has many treatments for day to day problems like hair fall, dandruff and hair growth. This Ayurvedic knowledge has been put to use to formulate many effective hair care treatments like hair oils, shampoos and conditioners. Rich herbs and nutrients are added to hair care products to guarantee you great hair. We list here the Best Ayurvedic Hair Oils in India. The oil contains bhringraj, olives, jojoba oil, Henna quinoa protein and other herbal extracts. It penetrates deep into the scalp and revitalizes the hair roots. The oil leaves your hair soft and smooth while its therapeutic benefits will fix all the damage done by everyday exposure to the sun and pollution. It is priced at Rs. 155 for 110 ml. The Sha Locks ayurvedic hair oil contains brahmi, shikakai and amla extracts. It also contains olive, peanuts and almond oils. Sha Locks prevents the cause of dandruff and keeps the scalp clean. The oil revitalizes the scalp and makes your hair come alive. It reduces greying of hair and itching of scalp. The oil is priced at Rs. 500 for 200 ml. 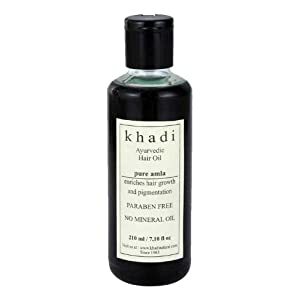 The Khadi Ayurvedic Amla hair oil contains amla, bhringaraj, sesame oil, almond oil, sunflower oil, camphor, tulsi and vitamin E. The oil helps improve the pigments in the hair and prevents premature greying. The oil moisturizes each strand of your hair from root to the tip, lending it luster and shine. It is priced at Rs. 350 for 210 ml. 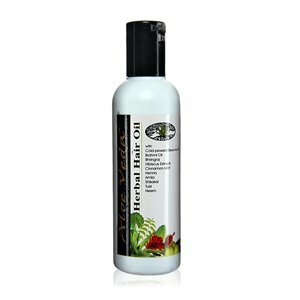 The Aloe Veda Ayurvedic hair oil contains hibiscus, henna, amla, cinnamon, shikakai, tulsi, neem, bhringraj and brahmi extracts. The oil has a cold pressed sesame oil base that helps in moisturizing the hair. The herbs in the oil impart a brilliant sheen to your hair. It acts as a natural UV protector. Regular use nourishes the scalp and improves hair growth. It is priced at Rs. 145 for 200 ml. Auravedic Hair Restructuring Oil has mustard extracts that prevents hair loss and amla that helps stimulate hair follicles. The nourishing properties of the oil help improve the texture of your hair and strengthen the roots of the hair. That means lesser hair fall and better hair growth. It is priced at Rs. 250 for 100 ml. 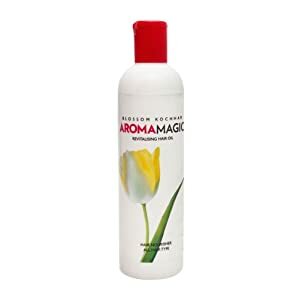 The Aroma Magic Hair nourishing oil contains triphala, shikakai, fenugreek rosemary, thyme and lemon extracts in a sesame oil base. The oil stimulates the scalp and prevents thinning hair. It helps revitalize dry and brittle hair. However, the oil is not meant for leaving overnight or long hours on hair. It is best for a quick shampoo where you leave the oil on the hair for about half an hour before shampoo. The oil is priced at Rs. 185 for 220 ml. 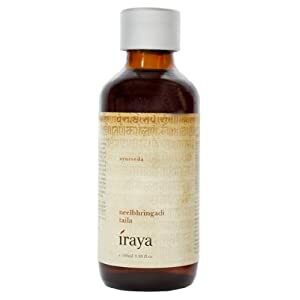 The Iraya Neelibhringadi taila is a formulation rich in selected herbs soaked in a cold pressed sesame oil and coconut oil base and slowly heated over a wood fired iron cauldron. The neelibhringadi taila helps in making your hair abundant, lustrous, dandruff free and shiny. It is priced at Rs. 495 for 100 ml.